Yesterday i went to RHS Tatton Park flower show. I took some pictures, mainly in the floral marque (but not only). I didn’t get round the whole of the grounds, too big, nowhere to sit down, and it started to rain – So i decided to come away. But i did go round the floral marque twice. Some brilliant displays in there. While i was in the floral marque, i had been looking at one of the stands, had my camera in my hand, noticed someone i thought i had seen before – took a moment to realise who it was. It was Carol klein, and i have seen her many times on the TV – just bought one of her books (grow your own garden). 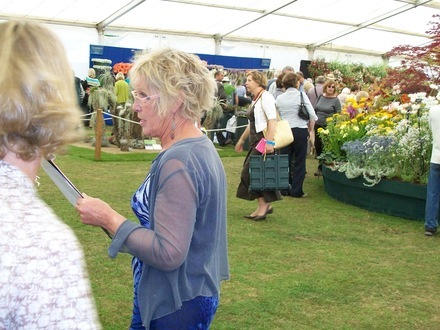 Carol is one of my favourite presenters, she always seems so enthusiastic about the plants, and the displays at shows. I will upload my pictures ASAP. (Already uploading to flickr). Next post: email from Shrewsbury show! I like her Mark, you are right when you say she always seems enthusiastic, she really enjoys gardening, look forward to seeing your pictures. Saw gardeners world and Tatton park on BBC 2 last night. They showed Carol in the floral marque, some gardens they showed i remembered looking at when i was at the show - seemed to make it all the more interesting, somehow! I know, all these shows are expensive. I think another time i need to be better prepared. I have a 3 legged foldable / portable stool type of thing which i forgot to take - never thought about it till i was there, and could have done with it - there were far too few seats there. Tired legs plus the rain put the tin hat on it, really - otherwise i would have looked round more, if not all of the showground. I think i got mine from a show a couple of years ago - the problem is remembering it before i go to a show rather than when i'm there - it's too late then. You're right, it took rather a long while. Was thinking maybe i had taken too many, but now i've uploaded them i'm glad i did. I like to look through them myself, particularly after the shows have finished. They are on the computer, but i think that if they are on GOY & flickr should something happen to loose them off the computer i will still have them here, just a precaution. There seem to be quite a few other people that also enjoy looking at them, so i'm pleased to put them where anyone can view them.